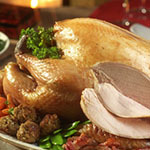 Morton’s Traditional Taste AWARD WINNING FREE RANGE NORFOLK POULTRY & Artisan Smokehouse At Whitwell Hall Farms, you are guaranteed a turkey that is reared to the highest welfare standards with a true “traditional taste” to savour. Our company began specialising in the production of free range and organic poultry. We now rear between 1000 -1500 free range Christmas turkeys, all sold direct to the consumer at the farm gate, online, or by mail order. Take a look at the Our Turkeys section and discover the 11 point quality code we follow to guarantee our Christmas turkeys do not disappoint. We also offer handy tips on how to cook your turkey, helping to ensure your Christmas dinner has an extra special, delicious touch. Recently converted “The Smokehouse” enables us to offer a wide range of smoked products, including succulent smoked duck and smoked chicken breasts. We use the traditional smoking process, combining molasses and whisky infused oak chippings to create sensational flavours.